The centre of a map tells you much, as does the choice where to begin a story, or a history. Arab geographers used to place the Caspian Sea at the centre of world maps. 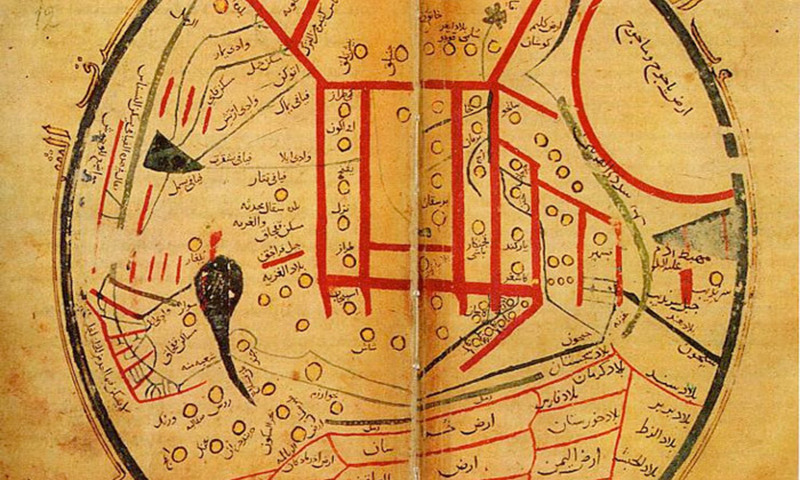 On a medieval Turkish map, one that transfixed me long ago, we find the city of Balasaghun at the heart of the world. How to teach world history today is a question that is going to grow only more and more important. Last summer in the United States, a debate flared when the influential testing agency Advanced Placement (AP) announced a change to its attendant courses, a change in which ‘world history’ would begin in 1450. In practice, beginning world history in 1450 becomes a story about how Europeans came to dominate not one but all the continents, and excludes the origins of alphabets, agriculture, cities and civilisation. Before the 1400s, it was others who did the empire-building, drove sciences, medicine and philosophy, and sought to capitalise on and extend the trading networks that facilitated the flow and exchange of goods, ideas, faiths and people. Under pressure, the AP College Board retreated. ‘We’ve received thoughtful, principled feedback from AP teachers, students and college faculty,’ said a statement. As a result, the start date for the course has been nudged back 250 years to 1200. Consequently, said the board, ‘teachers and students can begin the course with a study of the civilisations in Africa, the Americas and Asia that are foundational to the modern era’. Where that leaves Plato and Aristotle, or ancient Greece and Rome, is unclear – but presumably none are ‘foundational to the modern era’. That in itself is strange given that so many of the most famous buildings of Washington, DC (for example) are designed in classical style to deliberately evoke the world of 2,000 years ago; or that Mark Zuckerberg, a posterboy for new technologies and the 21st century, admits to the Emperor Augustus as his role model. Gone too is China of the Han dynasty (206 BCE-220 CE) and the networks that linked the Pacific with the Indian Ocean and the Mediterranean 2,000 years ago, and that allow us to understand that Asia, Africa and Europe were connected many centuries prior in a world that was effectively ‘globalised’. No space for the Maya civilisation and culture in Central America or for the kingdom of Igodomigodo in West Africa, whose economic, cultural, military and political achievements have been discarded as irrelevant to the ‘modern era’. Who cares about the Indian emperor Ashoka, or the Chola dynasty of Southern India that spread eastwards into South East Asia in the 10th and 11th centuries? The connections between Scandinavia and Central Asia that helped to bring all of northern Europe out of what used to be called ‘the Dark Ages’ don’t get a look-in either. And too bad for climate change and the ways in which looking at the changes in global temperatures 1,500 years ago led to the collapse of cities, the dispersal of populations and the spread of pandemics. History is at its most exciting and stimulating for students and teachers alike when there is scope to look at connectivity, to identify and work through deep rhythms and trends, and to explore the past by challenging assumptions that the story of the world can be charted through a linear progression – as the AP College Board seems to think with its statement linking 1200 with the ‘modern era’. If you really want to see how foolish this view is – and how unfortunate it is to narrow down the scope of the World History course, then take a look at the front pages in just about any country in the world today. In China, news is dominated by the Belt and Road Initiative, the Chinese-led plan to regalvanise the ancient networks of the past into the modern-day Silk Roads: there are many and sharply divergent views about the aims, motivations and likely outcomes of the Belt and Road Initiative. This is far and away the single most important geopolitical development in the modern world today. Understanding why Beijing is trying to return to the glory years of the Silk Roads (which date back 2,000 years) would seem to be both interesting, and important – and largely to be bypassed by the new World History scope. We can look to the other end of Asia, to Istanbul where, every year, hundreds of thousands of people take to the streets in Turkey to commemorate the Battle of Manzikert – which was fought in 1071. It might be useful to know why. Assessing the relationship between Russia and Ukraine might also be of some value in a period when the former has annexed part of the territory of the latter. A major spat broke out last summer between the two countries over whether Anne of Kiev was Russian or Ukrainian. She died in 1075. It does not take an expert to see the resonance of the 7th century across the Middle East – where fundamentalists attempted to build an ‘Islamic State’ based on their model of the early Muslim world, destroying not only lives and the region in the process, but deliberately destroying history itself in places such as Palmyra. It does, though, take an expert to work out why they are trying to turn back the clock 1,400 years and what their utopian world looks like. It matters because there are plenty of others who want to do the same thing: Imran Khan, the new Prime Minister of Pakistan, for example, has said that he wants to turn his country, with its population of almost 200 million people, into ‘an ideal welfare state’ on the model that Muhammad set in Medina in the 620s and 630s – a model that set up one of the world’s ‘greatest civilisations’. Students taking world history courses that begin in 1200 will not learn about any of these topics, even though their peers in colleges and schools around the world will. Education should expand horizons and open minds. What a shame that, in this case, they are being narrowed and shuttered. And what a shame too that this is happening at a time of such profound global change – when understanding the depth of our interconnected world is more important than ever. That, for me anyway, is the most valuable conclusion that is ‘foundational to the modern era’.